Prime Minister Stephen Harper didn't hesitate to comment on the NDP's misfortune on Thursday morning when MP Claude Patry defected from the New Democrats to the Bloc Quebecois. "This is an issue that has concerned us for some time, and does concern us: the ambiguity on Canadian unity that we have among some members of the NDP caucus in Quebec," Harper said according to the Canadian Press. It's a cheeky comment but, under the circumstances, probably appropriate. In his statement, Patry said he left the NDP because he disagreed with his party’s policy on Quebec sovereignty. "I consulted my family and I came to the conclusion that the recognition of the Quebec nation is incompatible with the continuation of a law that imposes conditions in Quebec," he said in his statement, according to the Globe and Mail. "I voted for Quebec sovereignty in the last two referendums, I hoped that Quebec should become a country and I still hope for that. "However, like many Quebecers in 2011, I thought the NDP would act differently to the Liberals and the Conservatives and that they really would recognize the aspirations of the Quebec nation. Recent positions taken by the NDP on the Clarity Act and the Churchill Falls project demonstrate unequivocally that the party favors Canada’s interests over those of the Quebec nation." Essentially he's saying he was a soverignist before he ran in the 2011 election and still is. Patry isn't the only NDP MP with sovereignist ties to win a seat in the 2011 election. MP — and former interim leader — Nycole Turmel was a member of the separatist Bloc for five years and quit only weeks before announcing she would run for the NDP in 2011. Shortly after the 2011 election, prior to being muzzled by party leadership, several other NDP MPs were vague about their allegiances. "I’m not sovereigntist, but if there as a referendum, I don’t know what I would vote," NDP MP Dany Morin said according to MacLean's. "Forty per cent of the population in Quebec is sovereigntist." MP Pierre-Luc Dusseault told a Toronto radio station separatism isn't dead in Quebec. "I think Quebec can flourish in Canada, but if Canada wants to work with Quebec... we have to consider the fact we have a different culture, a different identity," she said. "If there was a referendum tomorrow morning, we will see. The future will tell us." Former Bloc Quebecois leader Gilles Duceppe suggests that there could be more defections for the NDP in the future. In an interview with Yahoo! Canada News on Thursday afternoon, Duceppe said that members of the NDP Quebec caucus will face mounting pressure over the party's position on Quebec issues. "They'll be faced with the same type of problems" Conservative turned Bloc MPs faced in 1990, he said. 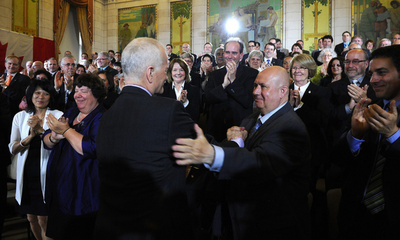 Duceppe even called-out one NDP MP by name. "I talked to Mr. Alexandre [Boulerice], he supported the referendum. In '95 he was a member of the [separatist] Quebec Solidaire," Duceppe said. "Just prior the federal campaign Boulerice was a sovereignist and on the last day of the campaign he said he was a federalist." It may have been in hiatus for a while but the NDP's sovereignty problem is back.